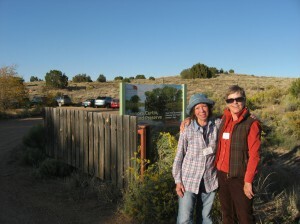 The Botanical Garden at Museum Hill and the Leonora Curtin Wetland Preserve are fully staffed by trained volunteer docents. Docents are of all ages, walks of life and educational backgrounds. Our Docent Training Program provides both classroom and on-site training, preparing volunteers to interact with visitors. Each training session includes classes, walks, and digital presentations, taught by our Teaching Team made up of experienced docents, educators, staff, and resource professionals. In order to volunteer, trainees are expected to attend all classes. Trainees may miss no more than two sessions, which must be made up when next offered. Upon successful completion of the training and shadowing days, trainees can begin volunteering in the Botanical Garden at Museum Hill and the Leonora Curtin Wetland Preserve. All volunteers must give a minimum of twenty hours per calendar year. Docents are responsible for the cost of materials and a personalized name badge, totaling $50. If this cost is prohibitively expensive, waivers are available through conversation with our volunteer coordinator.